It seems at times, home inspectors are damned if they do and damned if they don’t. What should report write-ups about home defects look like? If you talk to 100 agents and 100 inspectors you will likely get 200 answers. If you talk to clients, you will not likely get nearly so many answers. Since obviously, we are not going to get the answer from home inspectors or agents, I will, for this exercise focus on consumers. After all, it is them the report is written for is it not? If you asked agents this last question some would argue that it is for them to assist in negogiations. If you ask inspectors some would argue they are written to reduce their liability. Both would likely add that of course they are also written for the consumer. Sometimes who the report is written for gets lost in the nuances of other interests. It is obviously more complicated than this. Since I work for the client, I write my reports for the client. In that context I also know that the agent needs to be able to read it and understand it, repair persons will need to read it and understand it, but primarily, the client needs to read it and understand it. As I get to see a large number of inspection reports in the course of a year, I am noticing a trend toward simplification of report writing to the point of them becoming almost useless. I won’t go into all the reasons for this but a major reason is "time." There is a huge push to spend as little time on inspection reports so that the inspector can move along to the next inspection. To achieve this goal, the inspector relies on canned comments---canned comments that have a one-size-fits-all mentality. This kind of report writing is not “informative,” or “useful,” in any way to ANY of the parties involved in the transaction---except to keep the inspector moving on down the road. Keep in mind that not all inspections are even involved in a real estate transaction. This kind of reporting becomes even less useful when there is no agent involved to attempt to interpret whatever the report is trying to say. More important---this is NOT INSPECTING! What the report comment actually does is recommend that someone else do the inspection. Without documenting what exactly the issues are, what is the client to think? They could think there is almost nothing wrong or the house is in imminent peril. Home inspectors must provide enough information about what was observed to put the issues in some kind of context for the reader. The recommendation should discuss what the implications of the issues are; and, that would include some kind of indication as to the urgency of repairs. Can it wait until the electrician is at the home doing other things or does it need repairs yesterday? A more appropriate write-up regarding the electrical panel would include all the noted issues in the panel, what each of the issues means (why it is wrong) and what the implications of the issue are. Is the issue a fire hazard, a shock hazard or a maintenance issue? 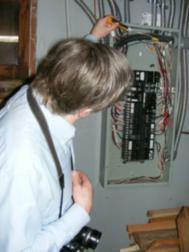 Most clients will have a knee-jerk reaction to “electrical issues” that is somewhat fearful or negative. Helping clients to understand the severity of issues can help them relax and have more room to deal with issues that might be of more consequence—electrical or otherwise. Obviously it takes more knowledge, experience and time to inspect in this manner.